JPEG Lossless Rotator is a portable tool for rotating digital photos and JPEG images without quality losses. In addition to preserving the quality of pictures, JPEG Lossless Rotator offers a neat and simple interface for viewing images and shell integration for quick mouse-click rotations. JPEG Lossless Rotator is very easy to use even for unexperienced computer users. Also features batch and automatic rotation, image flipping, renaming and deletion of files, digital photos EXIF-data displaying, command line, multilingual interface and portable version. 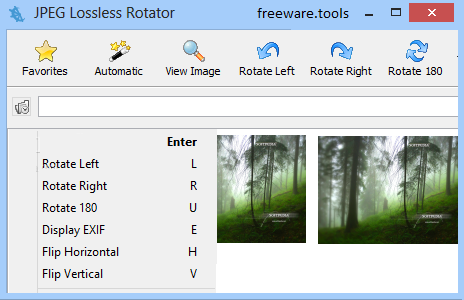 JPG Lossless Rotator Portable is a tiny software tool which can be used in order to rotate and/or flip one or multiple photographs in one single session. This is the portable version of JPEG Lossless Rotator, which means the installation process in not a prerequisite. As a consequence, the Windows registry will not be updated with new entries. Another aspect worth mentioning is that you can use JPG Lossless Rotator Portable on any computer you have access to, by simply moving the program files to a removable storage device, such as a USB stick. The interface is quite easy to handle, for people of all experience levels, even those with little to no experience with computers. Entire directories along with their subfolders can only be opened with the help of a tree view or a file browser, as the “drag and drop” function is not incorporated. It is possible to open pictures in your default image browser, use an automatic tool to rotate photos to a normal orientation, as well as delete or add them to favorites. Aside from that, you can view the EXIF data (digicam model, exposure time, resolution, contrast, saturation, sharpness, white balance, orientation of the camera) of a selected image, and reset its orientation to normal. To sum up, JPG Lossless Rotator Portable is a useful piece of software which does not put a strain on your computer’s performance, has a good response time and an intuitive environment. There are no errors, crashes or bugs.